In addition to human suffering, the security implications of water scarcity are also becoming increasingly obvious. Water wars is a term that was coined in the Middle East, but it is the existing conflicts that make the region's water crisis so much more difficult to solve. Almost four decades after Israel's occupation of the Golan Heights, the city of Quinetra is still a ghost town. For Syrians, its ruins serve as a reminder that the war will not be over until Israel gives back not only all of the land, but also all the water it has taken with it. Irssan Irssan was a little boy when Israeli tanks rolled into his village. Today, he is in charge of water resources in the Syrian controlled part of the Golan. He says there is a growing feeling of injustice among Arabs about the way water is distributed in the region. "Every Israeli uses 10 times more water than every Palestinian or Syrian," he says. "Israelis are digging wells in the Golan Heights, and they are taking the resource that should be shared." The Israeli government says it has not recently dug any wells or built any dams in the Golan Heights, but that the region's aquifers provide a crucial source of water for the country. And disputes over access to water have hindered the peace process in the past. It's a vicious cycle - as water becomes more scarce and competition for it becomes more fierce, ending the conflict is also becoming much more difficult. Water is also playing an increasing role in shaping relations between other states across the Middle East. Construction of upstream dams, without the consent of downstream states, has long been a problem in the Middle East, but never before have the consequences of these dams been so evident. 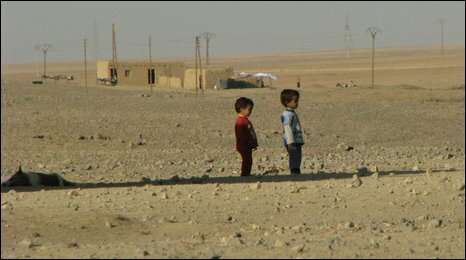 In Hasake province, in Syria's drought-stricken north-east, skeletal sheep and goats wander through parched fields and dozens of villages stand completely abandoned. River beds and canals are dry - not only because of the drought, officials say, but also because of dams that Turkey has built across the border. "If only Turkey allowed water to flow the same way it used to flow before the dams were built, our situation would be much better," said Motha Najeeb Salloum, governor of Hasake province. 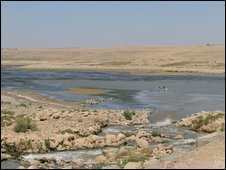 Both Iraq and Syria hope that, following intense negotiations, Turkey will begin releasing more water from the Tigris and Euphrates Rivers. While Turkey is also affected by the drought and needs the water for its farmers, in Syria there is no water left for irrigation. And now they are running out of their last drinking supplies. The region's main source of drinking and irrigation water - the main reservoir - has shrunk to 4% of its original size. "This is death level," says Samir Mora, the head of water resources of Hasake Province. "It's a disaster." The whole of Syria is feeling the effect. Roads around the capital Damascus are lined with makeshift camps. An estimated 300,000 people have already fled the north-east and officials say every day brings more refugees. With hundreds of thousands of people coming towards the cities, drought is changing the demographics of the Middle East. It is spreading poverty and social discontent and putting an additional pressure on already vulnerable societies. "Water is definitely a security problem in the region," says Samir Taqi, director of the Orient Centre for Strategic Studies, a Damascus-based think tank. "It has always been this way in the region, but now what is making it of much greater amplitude is that from one side the drought is much heavier, and second, the region itself is much more vulnerable geo-politically speaking." Experts say a whole array of measures is urgently needed to ease the situation: from reforming the agricultural sector, which consumes most water across the Middle East, to introducing better water management and better water-sharing agreements. "Water is a variable that could undermine any government, and the 'business as usual' approach to water scarcity would result in significant security challenges to local governments," says Hussein Amery, the author of Water in the Middle East: Geography of Peace. "If they don't take water security much, much more seriously, they are walking into a black hole." Few in the Middle East believe that water alone can ever become the cause of war, but its destabilising power is already apparent. "I am afraid that the region is running out of time. Crises are blowing up everywhere. There are some failing states in the region, which also endangers the whole figure of water distribution, immigration, stability conflict," says Samir Taqi. "This is why I say the region is very vulnerable. We have states that are collapsing, we have societies that are collapsing." Across the drought-stricken Middle East, tens of thousands of livelihoods have already collapsed. And with the growing desert, the prospects of regional peace grow more distant too.